Soon thereafter, Ashley met Michael Darby, an Australian real-estate millionaire, who is 29 years her senior. Sparks flew, and Ashley was introduced to a world she never knew existed. After four years of dating, the couple married, and Ashley went from 22 and single to wife and stepmother of Michael’s 24- and 26-year-old children. In addition to owning Oz Restaurant and Bar with her husband, Ashley is a certified yoga instructor and advocates that balance is about inner peace and outer physicality. Although she's having the time of her life, Ashley is still learning how to balance love, family, and business, and she hopes to expand her family with a baby. 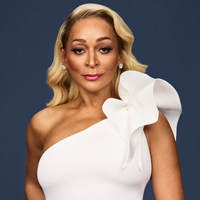 Candiace Dillard joins The Real Housewives of Potomac this season with a touch of sass and savviness. The 31-year-old former Miss United States was born in Biloxi, Mississippi, and grew up in Atlanta, Georgia, with her Air Force physician parents and siblings, Chris and Crystal. At an early age, Candiace learned what excellence looked like from observing her parents, who worked in different facets of the medical field. A graduate of Howard University, she served a tenure in the White House Offices of Public Engagement and Intergovernmental Affairs, where she liaised between the White House and the African American community for President Barack Obama. She later traded in her suit and heels for the campaign trail, where she served as a staffer for President Obama’s 2012 reelection campaign. In 2013, Candiace won the crown and title of Miss United States and hasn’t looked back since. She has competed in the pageant industry for many years and holds top placements in the Sunburst, National American Miss, National Miss American Coed, Georgia Miss American Coed, Miss Maryland USA, Miss District of Columbia USA, and Miss United States pageant systems. Originally from Virginia, Karen grew up on a large family farm and witnessed her father succeeding through hard work and perseverance. Karen took those strong values and followed her heart, living life to the fullest while achieving many successes. She is applying her entrepreneurial spirit in various beauty, fashion, and lifestyle ventures, and she reigns supreme as the grande dame of Potomac. She is an advocate and ambassador for Promoting Awareness Victim Empowerment (PAVE) and the Alzheimer's Association, and she uses her public speaking opportunities to uplift women, enabling healing and positive change. Although Karen is known for throwing over-the-top parties at her home, her family always comes first, and she is extremely proud of all that she has accomplished with her husband, Raymond, of 21 years, and her smart and savvy children, Brandon and Rayvin. Most recently Karen has been on a healthy mind, body, and soul journey as she and Ray are getting acclimated to life as empty nesters, enjoying their passions and charity work. A full-time single mom of two active sons, nine-year-old Corey and eight-year-old Carter, Robyn successfully maintains a balance between family, work, and fun. Never one to sit still, Robyn is pursuing a career as an event producer and has recently launched her own special events firm, Visionary Events in the DC/MD area. Additionally, Robyn and her mother, Gladys, have recently partnered on a new real estate investing venture, in the city of Baltimore. Robyn focuses her philanthropic endeavors on causes benefitting women, children, and families.